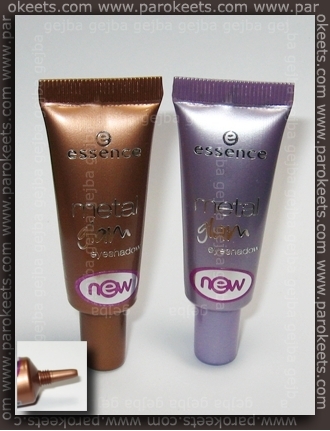 One of the new products on Essence shelfs are Essence Metal Glam eyeshadows. I bought two shades out of four: Gotta Have and Dressed Up. I left silver and green ones in the store … for now. 6.5g of product is enclosed in a hygienic tube – you squeeze out the amount you need and product stays unspoiled for 12 months. Dressed Up is light violets shade and is filled with lots of silver shimmer. In comparison to Gotta Have is not as good base for mineral make up and is more sheer but it is easier to spread over the eyelid. 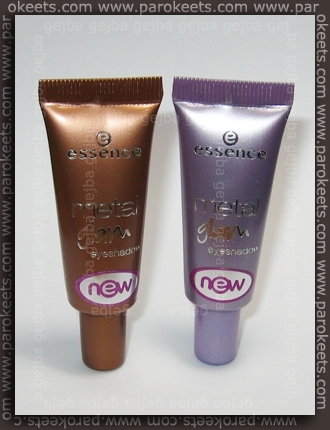 Essence Metal Glam Gotta Have eyeshadow got the appropriate name – it really is gotta have product. 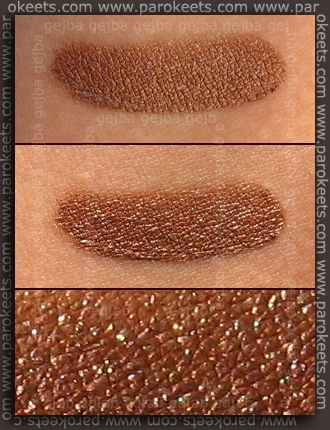 It has beautiful brown opaque base loaded with multicolored shimmer. I have very oily lids, so I used it over TFI. If you have normal eyelids you can skip TFI. Gotta Have is much more compact eyeshadow than Dressed Up, so you have to squeeze harder to get it out. I bought eyeshadows in Muller drugstore and paid 1.95 EUR (3 USD) for each. I never saw them in the Netherlands. Are these limited edition products? :whistle: They are both very nice. I especially like the last one. Great base for an eye shadow. Love the metallic look of the copper. Jst imam tudi rjavo in mi je super :wub: . Ravno na to sem čakala, potem ko so že davno ukinili eye shadow musse… sicer se mi zdi, da je bilo tisto bolj fino za nanašanje, samo tole je pa res, bolj higienično in ne posuši se v embalaži, tako kot se je tisto. Mousse senčke so bile res perfektne – škoda, ker so jih ukinili.